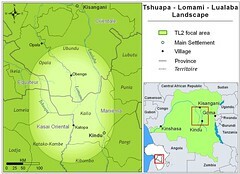 After Kindu I met John in Beni and we continued to the Okapi Reserve to meet with two TL2 team leaders. We arrived in Epulu completely beat and painfully saddle sore. 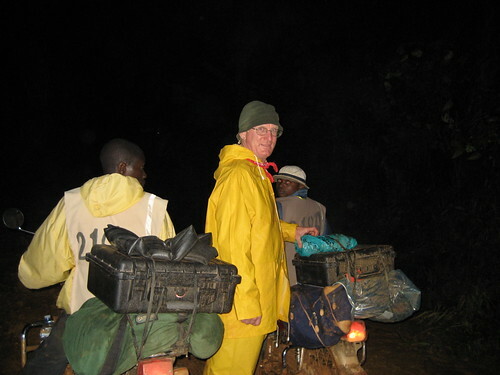 It was nearly midnight when we finally arrived at our home in the Okapi Reserve. 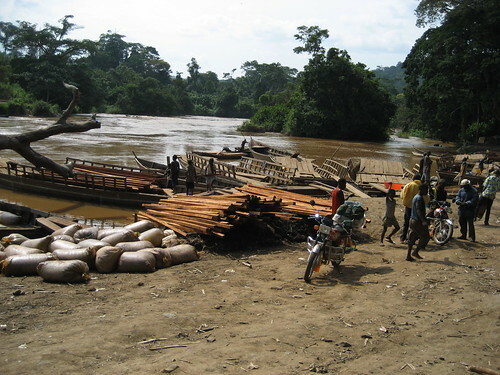 Traveling through Congo is never easy, but it should have improved along the RN4 (National Route 4) between Beni and the Okapi Reserve, after all the Chinese road crews had worked well over a year. What’s the problem? Since the war began and the road became impassable for bigger vehicles, John and I have ridden the backs of motorbikes more times than we can count. The war is now over and the road has been “repaired”. So, why is it worse? 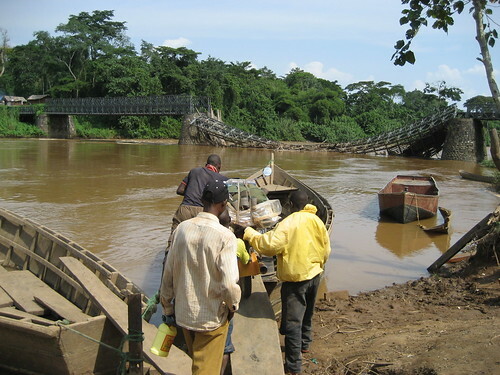 Reason one: The Ituri River bridge is out so we decided to take the “short cut”. How so? 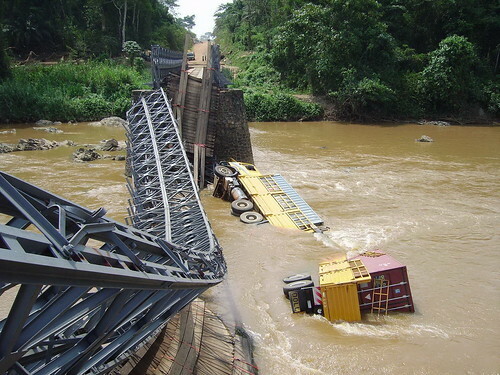 Within weeks after the Chinese improved the bridge, a Kenya-bound truck carrying nearly twice the permitted weight in illegal wood tried to cross the bridge. The result below. And yes, lives were lost. Reason two: Three days of rain had turned the “short cut” into a slick with soup filled pits. 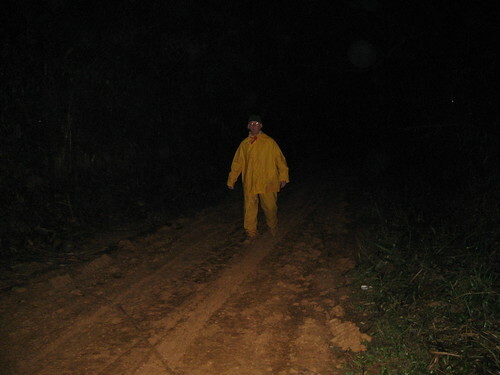 We were still traveling (sometimes on foot) well after dark. Along the worst stretches we let the bikes struggle by themselves and we trudged behind. There were plenty of “worst” stretches. Reason three: Face it – bad bikes. Even if the “motards” or drivers were courageous these flimsy Chinese-made SENKES did not measure up to our usual Yamaha AG100s. 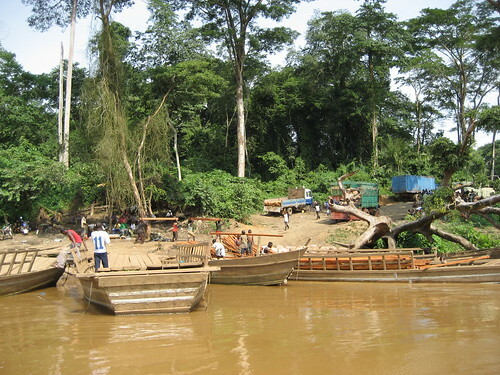 So, for the return trip we followed the Chinese-repaired RN4 all the way back and crossed by boat at the Ituri. Loading the motorbikes into a boat. It is no longer dugouts (see above) at the crossing. Big business deserves “big” boats. 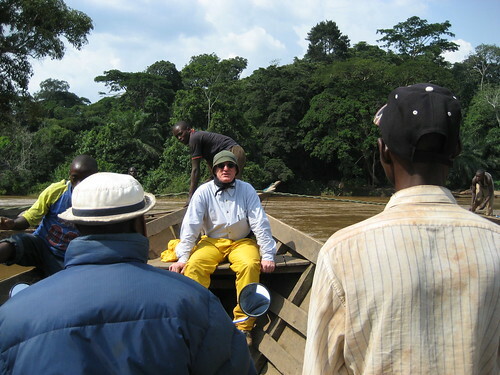 Waiting our turn to pull the boat across this massive Ituri River, still 800 km upstream from where it dumps into the Congo River. John perched in the bow as they begin to pull the boat across. As we approached the east bank we could see the trucks lined up mainly waiting for wood. Boys well under 16 were helping with the unloading. 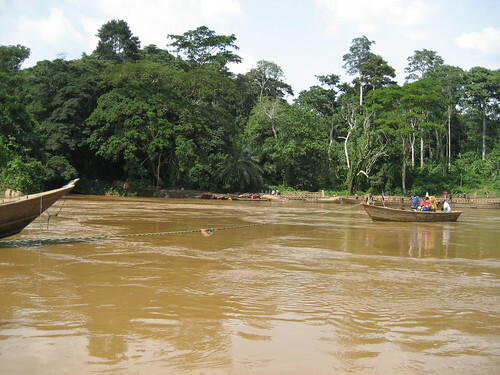 The sacks on the left are full of palm oil, another forest commodity. And we are ready to take off. 2. Chinese repaired Road – better than the Lebanese repaired section. The Chinese really worked! 3. 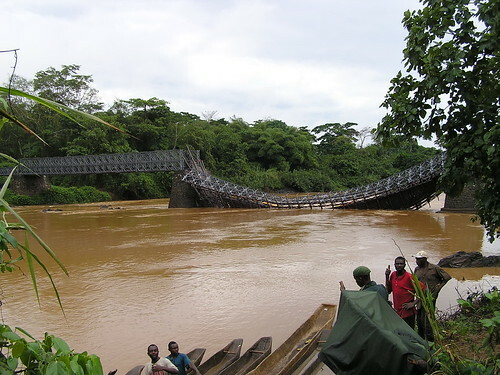 Chinese repaired Bridge – it would have been fine if the Congolese military who policed it did not take bribes …. This entry was written by Terese Hart, posted on 2008-08-19 at 10:22 am, filed under About the project. Bookmark the permalink. Follow any comments here with the RSS feed for this post. Post a comment or leave a trackback: Trackback URL. And I am sure that it is coming across!! absolutely certain, in fact. Ha! I thought the same thing as Wanda – where’s the bushmeat and illegal trade in wildlife and ivory? Unreal. Iris, glad you found the UNESCO site. The Okapi Reserve is a World Heritage Site in the Ituri Forest. World Heritage (established by international treaty) is overseen by UNESCO. Although severely challenged by the recent war in Congo there definitely is both a very viable population of Okapi and forest elephant left in the Okapi Reserve. It is a marvelous site!! 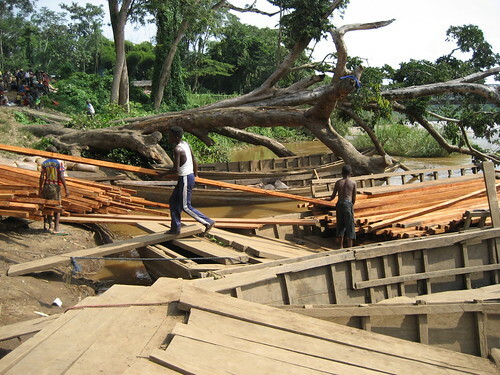 I loved the mention of the upgrade in boats – that’s Congo.